In a previous article, I discussed the CBO’s projection for a 96% public debt to GDP ratio by 2028. It was the catalyst for a modest decline in stocks that afternoon. It’s a weird response because the deficit projections for the next 10 years have little impact on the hour by hour trading. Sometimes the market prices in events gradually instead of all at once, so it’s not easy to see what is happening on a day to day basis. The fact that the government is going to be facing budget issues in the long term isn’t news. However, there might be a sharp reaction at some point in the future when interest rates rise and the government has a tough time spending money on necessary items. It’s possible that the current CBO projections aren’t affecting stock prices at all because investors wanting to take risk on stocks don’t have a choice when it comes to developed markets as most have high debt levels. It’s easy to come up with a country with a low debt level, but investing in one of them opposed to America isn’t a realistic choice because they are practically a different asset class. For example, India’s public debt to GDP was 52.3% in 2016 which is manageable. However, India is an emerging market which might not fit the needs of an investor considering developed countries. The chart below shows the change in deficits per year in relation to the change in the stock market since 1959. The stock market has increased 15.5% annually when the deficit was more than $500 billion and when the government had a $100 billion or less deficit, the market went up about 6% per year. The chart shows the averages mask the fact that the relationship is uncorrelated. Performance depends on the business cycle. 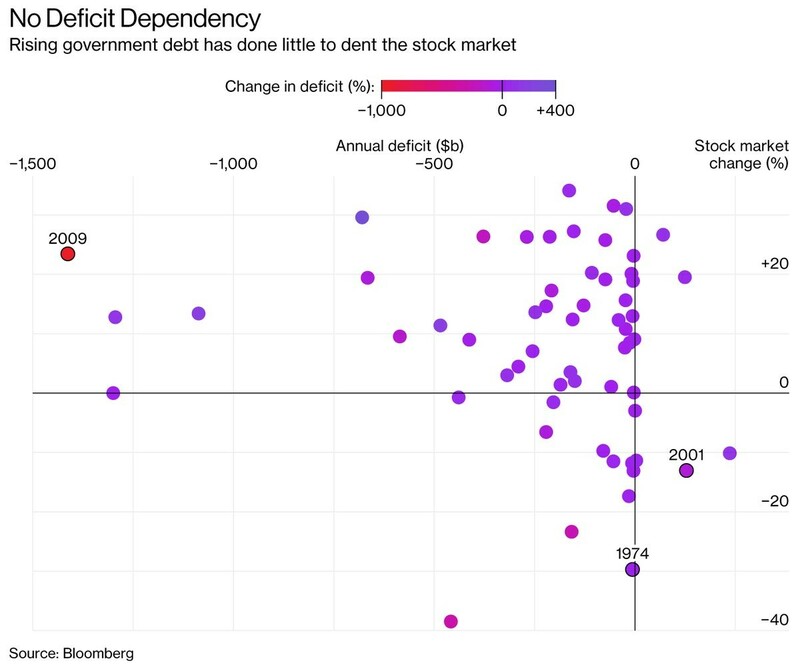 When the deficit is high, but shrinking, it’s a good time to buy stocks. Usually, when the deficit is relatively low, but increasing, it’s not a great sign. Using this guideline, it’s important to recognize that the deficits have been increasing over time. This means a high deficit compared to previous decades is actually low. Compared to the future deficits, the current one is probably low. The final point on this topic is that the theory on deficits is that the effect is cumulative. It implies growth will slow over time. As far as acting as a catalyst for stocks to decline, we’ll need to wait for the situation to get direr. As I mentioned, rising interest rates could do this. It appears the optimism in stocks peaked in January. However, that only means the multiple likely won’t exceed that peak. Stocks can still rally because earnings growth is in the teens. If stocks simply match earnings growth, a new all-time high will be made. To be clear, the market will crash before earnings growth plummets, so you can’t rely on expectations without doing due diligence. In this case, I’ve looked at the fundamentals and have concluded, that a crash isn’t on the horizon. 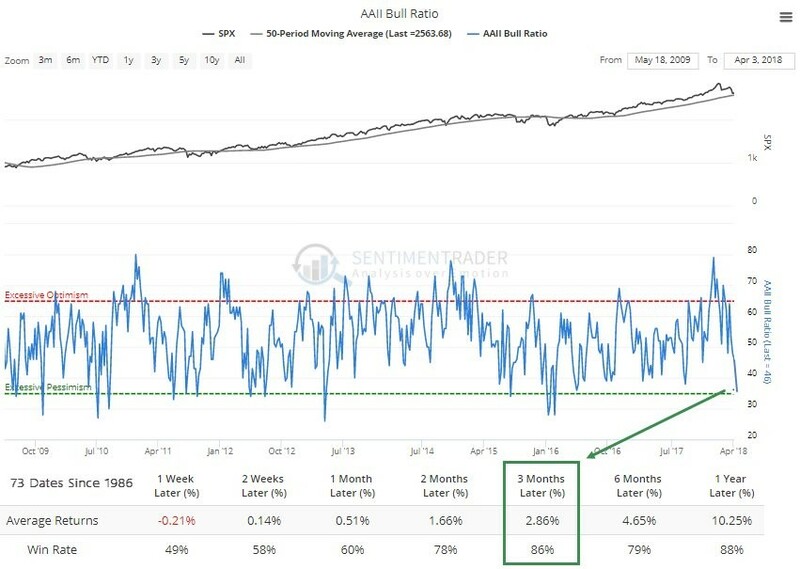 The chart below shows the AAII bear to bull ratio for retail investors. As you can see, since peaking at about 80, it has fallen to about 30. The chart on the bottom shows the average returns in the 73 occurrences it has fallen below 30 since 1986. As you can see, after the AAII survey reaches where it’s at now, the market increases 86% of the time with an average return of 2.86% over the next 3 months. This is a strong indicator to buy stocks for the near term. 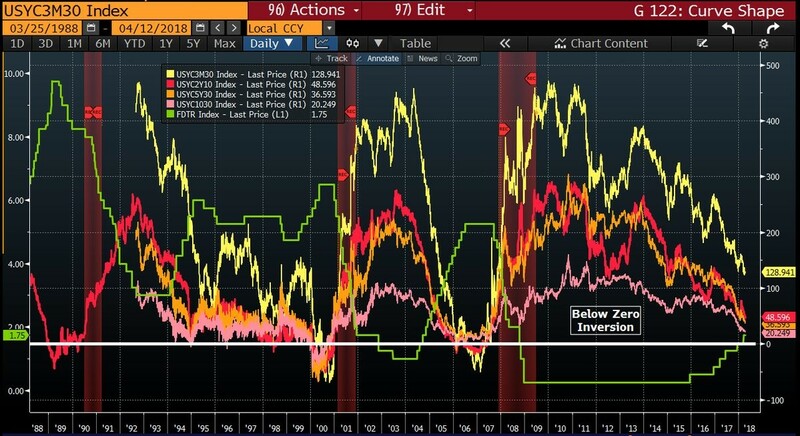 As you can see from the chart below, the yield curve over a few different terms is flattening at different rates. The difference between the 30 year yield and the 10 year yield is only 20 basis points making the flattest part of the term structure. As you can see, this is usually the case. The entire term structure’s slope converges at a flat and inverted point at the end of the business cycle. The difference between the 30 year yield and the 3 month yield is still at 129 basis points which implies there is about 2 years left in this business cycle. More mistaken rate hikes and a slowing economy could flatten the curve quicker than expected. Facebook stock gave back some of its recent gains on Thursday as it fell 1.47%. The bullet points below show disconcerting survey stats calculated by the technology research group Techpinions. As you can see, 17% of the 1,000 Americans surveyed deleted the Facebook app because of privacy concerns. 35% say they use Facebook less and 9% have deleted their account completely. These numbers are much higher than what Mark Zuckerberg seemed to suggest when he stated not many users have been deleting their accounts. Maybe he didn’t want to give forward looking statements since the firm is reporting earnings on April 25th. Another possibility is that when people are asked about whether they deleted Facebook they say yes without acknowledging that they reactivated it again at a later date. It’s popular to say you are using Facebook less so there might be a bias to claim this story directly affected users’ habits. If you say you aren’t changing your habits, you sound like you don’t care about your own privacy. I think it’s best to wait for the earnings call before making a decision on the stock. I think the stock will be range bound until then, but after the announcement it will have greater volatility than usual as investors are more squeamish than usual. Investors will want to know how many people deleted the service and how many advertisers left it. Finally, they will want to know how much the new initiative, which includes hiring people to combat fake news and offensive posts, will cost the firm. If margin estimates need to be revised lower, it will hurt the stock.